Let me introduce you to the AEG Comfort Lift Full Size Integrated Dishwasher that has revolutionised the dish washing world. What is the main feature of the AEG Comfort Lift Dishwasher? The main feature that makes this machine stand out is its cutting edge technology that allows you to slide and lift the lower basket to a comfortable and convenient height for loading and unloading – goodbye sore backs. 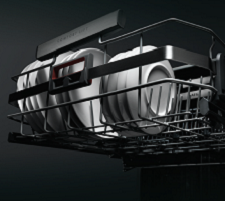 With its excellent energy ratings (A++), friendly noise level (44dB) and impressive range of programs, the AEG Comfort Lift is one serious contender if you are looking for a new dishwasher. The programs (13 in total) include a glass wash, quick wash (30 mins) and for those days where you need a little more oomph, an intensive 70 degree wash.
What other features does the AEG Comfort Lift Dishwasher have? This machine is jam packed with little extras that will make your dishwashing experience a whole lot better. Such features as adjustable top basket, floor beam to update you on wash status, and SoftSpikes and SoftGrips to protect your plates and glasses mean this machine just keeps on giving. One feature that seems to get people talking is the cutlery tray. This handy little device means there is no cumbersome basket taking up space, allowing you more room for dishes and its well thought out position aids loading and unloading. The air-dry technology delivers ideal drying results every time. This clever technology will automatically open the door (10cm) near to the end of the cycle allowing a natural airflow that leaves your dishes dry to the touch, saving you time as well and leaving your dishes spotless. This generously sized machine will hold approximately 13 place settings and gives plenty space for your larger items. Measuring at H81.8cm x W59.6cm x D55cm, the AEG offers an impressive 10L of space. A well-designed award-winning* machine that will enhance any family home or business. For more information on this impressive machine, then please feel free to contact us or pop in to see us in our Alness showroom. * Awarded the prestigious iF gold design award and an esteemed Red Dot Award.